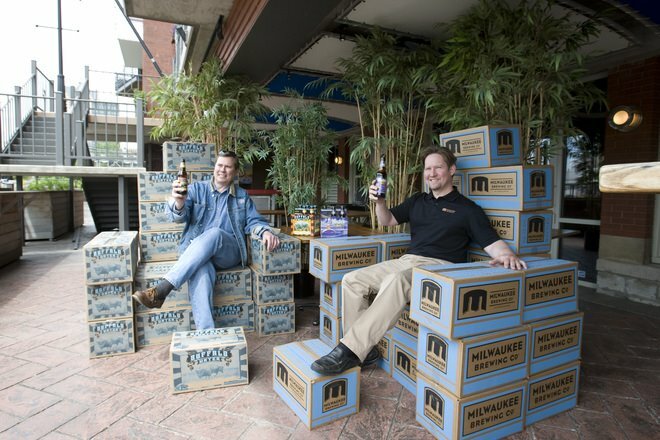 Bison Blonde lager co-creators Craig Peterson and Jim McCabe raise a toast at the Milwaukee Ale House on N. Water St.
To toast the father figures in your life this Father's Day, there are now literally hundreds of different brands of beer made in Wisconsin. But don't just hand Dad his favorite brewski or buy him a six-pack. Think creatively. Falling as it does on Sunday, the day is ideal for brunch. An unfiltered hefeweizen makes a fine substitute for champagne in a mimosa mixed with orange juice. If you're a fan of barbecue, you could marinate a batch of Buffalo chicken wings to grill for dinner. It's the designated dish to serve with Buffalo Water Brewing Co.'s Bison Blonde lager, the creation of two brewing entrepreneurs, Jim McCabe and Craig Peterson, who also happen to be fathers. Peterson, who is also the owner and CEO of public relations firm Zigman Joseph Stephenson Inc., met McCabe through work with the Wisconsin Brewers Guild. Over several months, Peterson and McCabe discussed the possibilities of brewing up a new business, and in December of 2007, Buffalo Water Brewing Co. launched its first brew. McCabe is one of the founders of the Milwaukee Ale House and the Milwaukee Brewing Co., the contract brewery that makes Buffalo Water's Bison Blonde lager. As for Father's Day, McCabe said his two young daughters and wife make most of the plans, "but if I have anything to do with the dinner, a craft beer will definitely be part of the meal." Peterson recalled Father's Days of his childhood. "My father and both grandfathers were meat cutters, so with most meals, especially holidays, it was all about the meat," he said. "In the late 1960s my dad had the first gas barbecue on the block (actually mainlined into the gas line - no bottled propane here), and his special barbecued chicken with homemade sauce is still my all-time favorite. "Today, my sons Andrew (11) and Hunter (7) have followed in my footsteps and help make barbecue the center of Father's Day." 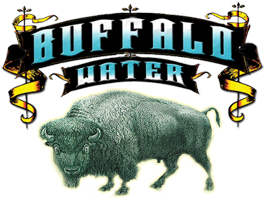 Buffalo Water Bison Blonde took a silver medal in the Kohler Festival of Beer competition last month. The lager has culinary uses, too. At Triskele's restaurant, 1801 S. 3rd St., the chefs include the brew in batters for fish fries and onion rings. Another Milwaukee father and brewer, Russ Klisch, has been working hard on the launch of a new ale, Wheat Monkey, released by Lakefront Brewery last week. He looks forward to Sunday as a chance to finally relax. "Hopefully, I'll have my first vacation day in months, and will be taking it easy and doing absolutely nothing on Father's Day," he said. "My wife, May, will grill the things our family likes, such as burgers and brats." Beer will be incorporated. "She'll add a bit of dark beer to the barbecue sauce to thin it out for basting," Klisch said. Here are three recipes to make Father's Day a feast, from morning brunch to spicy grilled finger food fit for a party. Craft beer maven Jeff Mendel prepares this with Left Hand Brewing Co.'s Haystack Wheat, but any unfiltered wheat ale with citrus hops character can be used. From "The Best of American Beer and Food" (Brewers Publications, $22.95). Let bottle of ale sit out at room temperature at least 6 hours to allow the yeast to settle to the bottom of the bottle. Carefully decant the first 10 ounces (1 ¼ cups) of the bottle into 2 glasses and reserve for Orange Ale-mosa. The remaining 2 ounces in the bottle should be very yeasty and opaque. Swirl the bottle to mix the yeast. In a bowl, combine the eggs, yeasty ale, cream and spices. Beat with electric mixer until mixture is smooth and aerated, with lots of bubbles. Place bread slices in a large jellyroll pan with deep rim and pour egg mixture over it. Turn bread to coat evenly and let soak until almost all of mixture is absorbed. Prepare a greased griddle or large skillet, with 2 to 3 sprays of oil, and place over medium heat. Use a spatula to place soaked bread on hot griddle. Cook and turn bread pieces two or three times until both sides are golden brown. Arrange French toast on warmed plate. Pour powdered sugar into a sifter and tap over toast. Add syrup and fruit. Lakefront Brewery owner Russ Klisch's wife, May, incorporates the local brewery's Cream City Pale Ale into a brine, marinade and sauce for grilled pork tenderloin. Slice pork tenderloin lengthwise into two long pieces. Then cut meat crosswise into ¼-inch slices. Place meat in a zippered bag with salt, sugar and ale; brine in refrigerator about 1 hour. Drain, pat dry and place meat in bowl. Make marinade, then add to pork and refrigerate at least an hour. While meat marinates (about 40 minutes before you plan to start grilling), make sauce. Wash and dry cucumber; cut crosswise into angled slices about 1 inch thick. Peel onion and dice into 1-inch pieces; break into individual layers. Set aside. When ready to grill, remove meat from marinade. Thread 2 to 3 pieces of meat onto each skewer. You will have to bunch slices of meat in order to thread. After you've threaded all the pieces of meat, gently push meat to one end of the skewer. When meat is skewered, pat dry and brush with oil. Heat grill to medium high. Place ends of skewers with the meat on grill and cook 1 minute, just until seared, then flip over. Grill until meat is done but still tender. Serve satay on skewers with sauce, cucumber and onion. Cut lemongrass into ½-inch slices. Bruise the lemon grass by pounding with a meat mallet. Peel and roughly dice shallots. Place in food processor with coriander, cumin, brown sugar, soy sauce, curry powder and ale. In saucepan, combine ale, stock, coconut milk or cream, brown sugar, lemongrass, soy sauce and curry powder over low heat, stirring until incorporated; let simmer uncovered 15 minutes, stirring occasionally. Let cool off 10 minutes; remove lemongrass. Place peanut butter in a bowl and add tablespoonfuls of the liquid at a time, stirring to blend. This recipe is adapted from "Grilling with Beer" ($21.95), www.grillingwithbeer.com. Place wings in bowl and cover with lager; stir, cover bowl and chill at least 6 hours. In large Dutch oven, melt butter; add garlic and jalapeños. Sauté over low heat until jalapeños are tender. Add hot pepper sauce and black pepper. Mix well and simmer 3 minutes. Remove from heat and let cool to lukewarm. Place in blender and purée until smooth. Grill at medium heat. Drain wings and thread on skewers, 3 to 4 pieces per skewer. Keep pieces of similar sizes together so chicken will cook evenly. Place skewers on grill over indirect heat (or use a grill basket). Cook 25 minutes or until very brown and crispy, turning every 5 minutes. Arrange cooked wings on platter, cover with prepared pepper sauce and serve.